So we all now know for sure how the marketing works. Put the price up and give you the code to bring it down. I am after Tumble Dryer as you can make out as i already posted on of the deal that i did thought was good but eventually didnt end up buying. I was specifically looking for the one with heat pump and 5 year warranty for peace of mind. DISCOUNT CODE - £40 off the marked price. Enter code LKA40 at checkout. Also available in store. Hurry, ends Tuesday!Save £40 off the marked price. For home delivery orders enter code LKA40 at checkout. For reserve and collect orders, discount will be applied in store. Offer ends 05/12/2017. Cannot be used in conjunction with any other offer. Enjoy practical, efficient drying with the A++ energy rated Grundig GTN38250HGCW Heat Pump Tumble Dryer. 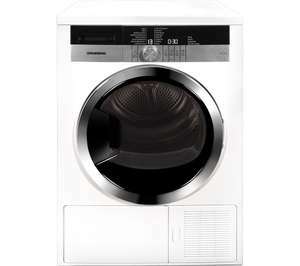 Boasting a large 8 kg drum capacity, the GTN38250HGCW is ideal for heavy laundry days. Dry all your family's clothes in one go and save time and money. With a variety of dedicated programs to choose from, you can find the perfect cycle to suit your clothes, whether you're drying delicates, shirts, jeans or sheets. Prevent clothes from over drying and protect delicate fabrics thanks to the GTN38250HGCW's intelligent sensor drying. Simply set the level of dryness you need for your laundry and the tumble dryer will automatically identify the levels of moisture in the drum and stop the machine when the desired level has been reached. The GTN38250HGCW's clear LCD display with touch controls is straightforward and easy to use. Select your program and the indicators will show you the time remaining during each cycle and the start of the delay timer. As a result, you can enjoy complete control over your laundry and schedule. For complete versatility, the Grundig tumble dryer features 16 drying programs and three temperatures. The Anti-creasing function rotates the drum every 60 seconds for up to two hours after the cycle has finished. By keeping the laundry moving it helps clothes stay crease-free so you can cut down on ironing. Thanks to the GTN38250HGCW's auto cool down feature, you can comfortably unload your laundry once the cycle has finished. The cool down phase blows cool air into the drum just before the cycle ends to ensure clothes are cool to the touch. Take the chore out of laundry days and enjoy intelligent drying with the Grundig GTN38250HGCW Heat Pump Tumble Dryer. I am not sure am i allow to put the review from WHICH, but it has rating of 65% and to put it in to perspective there are 20 better model ahead of this. Also it need 66% to get in to BEST BUY. This is now priced to 449£ it was previously on 419£. It's shame that they raised the price to 449 pounds! 10 hours ago, it still 419 pounds.